Music can be sophisticated to the highest level but what does sophistication mean? Not one for taking the easy route, Brann Dailor is very much a perfectionist yet what shines through just as much is a sense of voyage. Swapping King Crimson for Tangerine Dream, a different kind of sophistication presents itself in the form of Arcadea. As the brightly coloured artwork would suggest Arcadea’s raison d’être is to transport the listener into a prehistoric plain. Where you’ll have to vanquish the “Gas Giant” all the while navigating the volcanic activities of “Army of Electroncs“. Despite not having a specified laid out concept the idea of Arcadea is itself entirely otherworldly. Every track is very much stuck in the vein of classic synth. Learning from the other band Dailor is known for, here the drummer is given free vocal reign. Given his bigger vocal contributions of late it gives the man a very distinctive voice. Working particularly well against the Aphrodite-esque female vocals on “Neptune Moons“. Of course there will be relations to the Atlanta quartet, that’s just unavoidable but Dailor brings new qualities to Arcadea that have not been previously seen before. It’s particularly interesting to see how Arcadea have put together their Sci-Fi skronking choruses in “Electromagnetic” where it almost sounds like they might break out into “Somewhere Over The Rainbow“. Principle lyric writer for the conceptual ideas from Mastodon, Dailor brings this slight prehistoric feel into the arena of Electronica and does so fantastically. “Through The Eye of Pisces” brings the levels down somewhat for a brief moment of rest. Never overzealous, the band enable you to have a metaphorical thread in the electronic labyrinth with the help of Dailor’s voice while simultaneously getting entirely lost in the soundscapes of the music. What kept me intrigued from the moment I heard of the band however is this sense of mystery that is created with oscillating sounds and pitch shifted vocals. 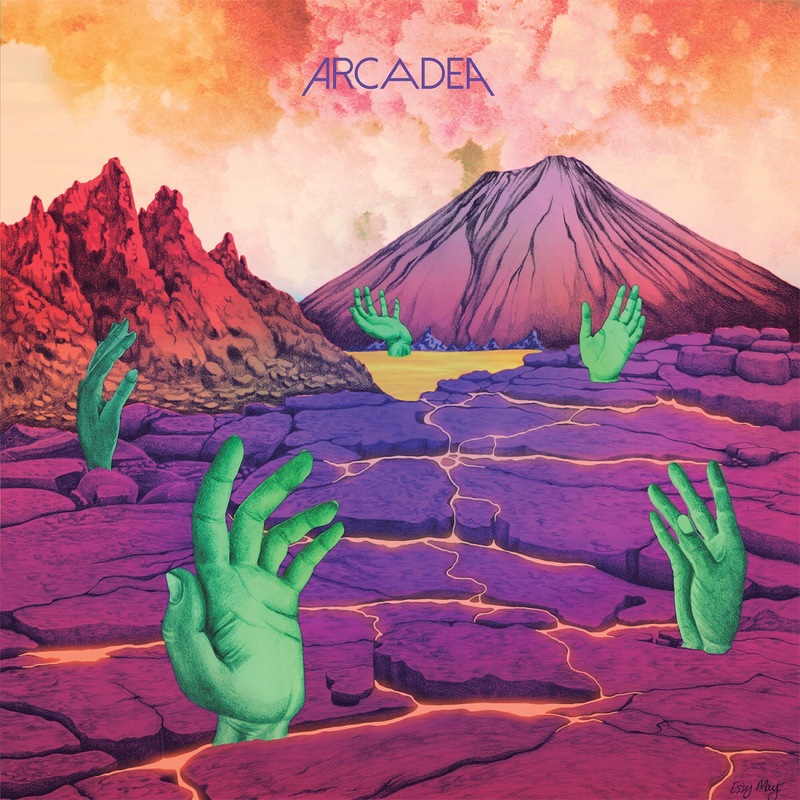 Though no doubt there will be some who are already into Electronica, for those who might not and have flirted with the idea, a gateway band like Arcadea would be a perfect introduction to the sophistication of the more minimalist of genres. One of the biggest bands on the planet of late, Mastodon are their own entity entirely but with Arcadea, Dailor explores ideas that have always been dormant in his musical psyche to brilliant effect. With the help of keyboardists Core Atoms and Raheem Almani, whose finest hour is final track “Magnificent Façade” the band well and truly depart our planet and take you to their in a beautiful instrumental outro. Giving absolutely brilliant performances that would no sooner have you enraptured in their space-age, time travelling tales than you would be in Prog itself, it would be a shame to miss out on Arcadea’s foray into the unknown. It’s one hell of a trip. If you like what you read / heard then you can pick up the album here!